It was with a lot of excitement that I didn't get dressed in my uniform this morning because it was black out day for my school. There was going to be a sausage sizzle on as well. We wore black to show our support for the All Blacks on the opening day of the Rugby World Cup. Running down the footpath shouted to my friend “Where are you going?” . A lot of people were wearing black clothes. As coins jingled in my pocket as I bounced about excitedly - I was going to buy a sausage for my lunch. Arriving at school, I noticed, to my surprise, that even the teachers were wearing black. Miss Tito and Miss Va’afusuaga had black wigs on and even had their face painted. I thought to myself that today was going to be cool. At assembly Mr Burt kept telling stories about the times when he was at rugby games and he was not wearing his hat. Mr Burt’s stories are very interesting and he is a great storyteller. Mabye he might write a book one day. In our classroom we painted some All Black players so we can hang it in our room. We had to trace around a small person then go and paint the picture that we traced. Finishing painting we went inside to add more detail to it with crayons. After morning tea team four all went to the courts to play some rugby games . The sun was shining and the sevens boys had set up some fun looking activities for us . I was in team Namibia. Tackling the bags I got the hardest hit for bumping it off. 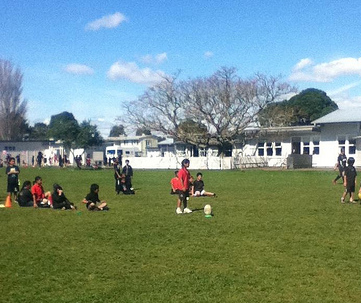 As Feki did a example for the activity that we were going to do it looked very hard. When that finished we went to the next two boys which were doing kicking. It was fun and my team came third. I ate my sausage at lunchtime under the of trees - it felt like summertime. I had such a great black out day and I really hope that the All Blacks can win tonight. My brother is supporting Tonga, but I don’t know if they will win.